I've been expecting trademark applications for CHICAGO WEST to follow the birth of Kim Kardashian and Kanye West's daughter last month (after all, Beyonce spent about $12,000 on filing fees to file trademark applications for her twin's names last year), but it appears the first CHICAGOWEST trademark application isn't related to the celebrity couple. Instead, the first CHICAGOWEST trademark application, which was filed by ChicagoWest, LLC on February 4th, covers "hot dog sandwiches; popcorn; sandwiches" and appears to be related to a food truck (the website actually pokes fun at the situation, thanks Kim and Kanye for naming their daughter after their food truck, and announces the release of a new menu item called BabyWest). According to the trademark application, ChicagoWest, LLC has been using CHICAGOWEST as a trademark since September 15, 2016 (long before the birth of Kim and Kanye's daughter). Will there be beef (ha!) between ChicagoWest, LLC and Kim/Kanye? It depends. As an initial matter, Kim and Kanye would need to use CHICAGO WEST as a trademark to assert trademark rights in the name. 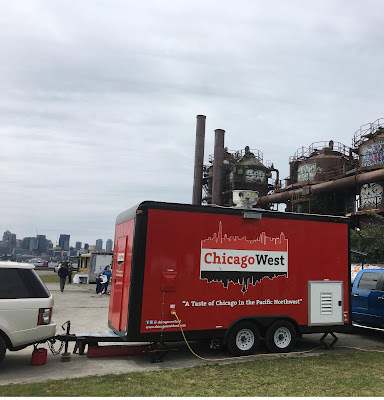 Generally, this means they are selling goods or providing services under the CHICAGO WEST name, rather than merely using it as the name of their daughter. Further, goods and services offered under a trademark must be related to those offered under another similar trademark for infringement to arise (or for the Trademark Office to refuse to register a later filed application under Section 2(d) of the Trademark Act). If Kim/Kanye do not use the CHICAGO WEST name as a trademark with any goods/services related to sandwiches, hot dogs, and popcorn, it would be difficult to assert infringement of ChicagoWest, LLC's mark (and Kim/Kanye could likely obtain a federal trademark registration for CHICAGO WEST for different goods/services). Finally, ChicagoWest, LLC apparently started using CHICAGOWEST as a trademark in September 2016, well before the birth of Chicago West. Because the first to use a trademark is generally the senior user, and therefore has priority (at least in conjunction with the goods/services it offers), Kim/Kanye might have difficulty using and registering CHICAGO WEST as a trademark in conjunction with foods (and maybe restaurants). This would also make it difficult for Kim/Kanye to go after ChicagoWest, LLC for using or registering CHICAGOWEST as a trademark for sandwiches, hot dogs, and popcorn. In sum, it seems unlikely that a fight will cook up between this food truck and Kim/Kanye (at least in the trademark context), but the actions of third parties are impossible to predict. Note that this is a trademark blog, so I won't go into detail about other laws that might be applicable, such as the right of publicity.